Peptide binding to MHC class II (MHCII) molecules is stabilized by hydrophobic anchoring and hydrogen bond formation. We view peptide binding as a process in which the peptide folds into the binding groove and to some extent the groove folds around the peptide. Our previous observation of cooperativity when analyzing binding properties of peptides modified at side chains with medium to high solvent accessibility is compatible with such a view. However, a large component of peptide binding is mediated by residues with strong hydrophobic interactions that bind to their respective pockets. If these reflect initial nucleation events they may be upstream of the folding process and not show cooperativity. To test whether the folding hypothesis extends to these anchor interactions, we measured dissociation and affinity to HLA-DR1 of an influenza hemagglutinin-derived peptide with multiple substitutions at major anchor residues. Our results show both negative and positive cooperative effects between hydrophobic pocket interactions. Cooperativity was also observed between hydrophobic pockets and positions with intermediate solvent accessibility, indicating that hydrophobic interactions participate in the overall folding process. These findings point out that predicting the binding potential of epitopes cannot assume additive and independent contributions of the interactions between major MHCII pockets and corresponding peptide side chains. The MHC class II (MHCII)3 molecules are heterodimeric cell surface proteins fundamental in initiating or propagating an immune response by presenting antigenic peptides to CD4+ T lymphocytes. Selection of peptide via the MHCII pathway (epitope selection) occurs within specialized cells of the immune system through a series of molecular and cellular events (1). Nascent MHCII molecules produced in the endoplasmic reticulum and complexed with a chaperone molecule called invariant chain (Ii) are delivered to specialized lysosomal compartments (MIIC); a region of the Ii molecule (CLIP) interacts with the peptide-binding cleft of the MHCII molecule to stabilize the nascent MHCII and prevent the binding of other endoplasmic reticulum resident peptides. In the MIIC, characterized by a low pH environment, the Ii molecule bound to MHCII is cleaved through the action of proteases such as cathepsin S, leaving CLIP bound to the binding grove. In the MIIC a nonclassical class II molecule called HLA-DM facilitates the removal of CLIP by inducing peptide exchange (2). The MHCII/Ag structure, as shown by x-ray crystallography studies, provides some evidence for the rules that govern peptide recognition by class II molecules. Unlike MHCI, the binding cleft is open at both ends; thus, peptides of varying lengths are able to bind MHCII. Second, the peptide adopts a type II polyproline helix as it interacts with the binding groove; this conformation causes the peptide to twist in a specific fashion, with the sequestration of peptide side chains in polymorphic pockets in the MHCII protein (3, 4). Generally these pockets accommodate the side chains of peptide residues at the P1, P4, P6, and P9 positions and have been identified as major anchors; in addition to these largely solvent inaccessible interactions, positions with smaller pockets or shelves in the binding site accommodating the P2, P3, P7, and P10 residues are recognized as minor (5) or auxiliary (6) anchors. Last, there is a conserved array of hydrogen bonds (H-bonds) from side chains in the MHCII molecule to main chain atoms of the peptide. Due to this structure, the peptide/MHCII interaction has been interpreted as a docking event mediated by independent contribution of each side chain. Furthermore, the ability of the peptide to sequester anchor residues into conserved pockets in the MHCII has been thought to dominate the outcome of epitope selection events (6, 7, 8). Therefore, prediction based on the primary sequence has been largely empirical. Using the binding of random peptide libraries or peptides recovered from class II molecules, matrices have been constructed with values for each amino acid residue at each position. Such approaches fail to account for the evidence that significant conformational rearrangements occur in the peptide/MHCII complex during binding. Indeed, detailed kinetic analyses of peptide binding to empty MHCII or to a fast dissociating peptide/MHCII complex, have pointed out the presence of two distinct conformers of MHCII: an open or fast dissociating species and a closed kinetically stable form (9, 10). Moreover, it has been known for some time that MHCII molecules must bind to a peptide for efficient cellular trafficking and presentation and to prevent aggregation of the empty form (11). These data suggested the hypothesis that peptides are a critical determinant of MHCII structure, and both biochemical and biophysical techniques have shown that peptide binding to human MHCII (HLA-DR1) results in a condensation of the DR1 molecule around the peptide (12). Therefore, it is perhaps more informative to consider peptide/MHCII binding as a bimolecular event in which the MHCII and the peptide fold together, leading to a conformational transition resulting in a lower energy form of the MHCII (13). Biophysical studies of molecules with one binding site suggest that a cooperative effect is associated with the folding process the receptor undergoes when the interaction takes place (14). For instance, in the binding of glucose to glucokinase, the biphasic transient kinetics is consistent with a two-step reversible binding mechanism of an initial bimolecular binding event followed by a slow enzyme isomerization step. This kinetic model is similar to that elaborated for the MHCII/peptide interaction, for which two conformers have been recognized that change as a function of bound peptide (9). We have previously tested this hypothesis analyzing a series of substitutions positioned across the binding groove that do not influence the primary hydrophobic anchor interactions but destabilize the H-bond network. We observed that within a certain range of affinity peptide binding is highly cooperative and we interpreted this cooperativity as evidence of the folding process. We extended these observations to include the effect of changing a side chain involved in a weak hydrophobic anchoring at P7, indicating that in addition this energetic source can contribute to cooperativity (15). Similar studies performed on peptide/I-Ad complexes revealed that the energetic contribution of a given anchor-pocket pair depends on the overall peptide sequence, suggesting coupling to directly adjacent residues (16). However, more detailed investigations would be required to relate cooperativity to the folding process and its effect on the epitope selection. In this study, we focus on the positions at which solvent accessibility is minimal, testing whether the hydrophobic pocket interactions show cooperativity. Through a multiple, iterative amino acid substitution strategy in the hemagglutinin (HA) peptide, we find cooperative effects on peptide binding and dissociation, indicating that binding at one pocket changes the structure so as to favor, or prevent, the binding at a second pocket. We extend this observation to include the mutual effect of simultaneously changing residues involved in hydrophobic anchoring and residues predicted to either directly or indirectly involve H-bonding, indicating that all energetic sources can contribute to cooperativity. Accordingly, we discuss the effect of cooperativity on an epitope identification system. Peptides derived from the sequence GPKYVKQNTLKLAT, representing residues 306–318 of the HA protein from influenza A virus (H3 subtype), are described in Table I⇓. The N-terminal Gly facilitated labeling. Side chains in the HA peptide are numbered relative to the P1 Tyr residue (5). Peptides were synthesized by standard solid-phase methods, purified by HPLC, and confirmed by mass spectrometry. N-terminal labeling with FITC (Molecular Probes) or LC-LC biotin (Pierce) was performed on the resin before deprotection, and then peptides were cleaved and purified by HPLC. Recombinant soluble empty (peptide-free) DR1 was produced and immunoaffinity purified from a stably transfected Drosophila S2 insect cell line essentially as described by Stern and Wiley (17). Purity was confirmed by SDS-PAGE, and protein was concentrated using centrifugal ultrafiltration (Amicon). DR1 protein was quantified by measuring the UV absorbance at 280 nm using an E280 of 56,340 M−1 cm−1. DR1 protein was buffer exchanged into PBS (7 mM Na+/K+ phosphate, 135 mM NaCl (pH 7.4)) before use. DR1/peptide complexes were formed by incubating 1 μM DR1 protein with a 10-fold molar excess of FITC-labeled peptide in 50 mM NaH2PO4 and 50 mM sodium citrate (pH 5.3) and protease inhibitors for 16 h at 37°C. DR1/peptide complexes were then purified from unbound peptide by buffer exchange into PBS with a Centricon-30 spin filter that had been preincubated with 25 mM MES (pH 6.5). Purified DR1/peptide complexes were then quantified by reading the UV absorbance at 280 nm, factoring in an E280 of 1280 M−1 cm−1 for the Tyr residue and 10,846 M−1 cm−1 for the fluorescein present in the bound peptide. Purified DR1/peptide complexes (85 nM) were then incubated with 10 μM unlabeled HA peptide at 37°C in 50 mM NaH2PO4 and 50 mM sodium citrate (pH 5.3). To prevent nonspecific adherence of the protein, siliconized tubes were used. At various time points, aliquots of the reaction were removed and quenched with 0.5 M Tris-HCl (pH 8.0) in gel loading buffer and immediately placed on ice. The aliquots were then loaded onto a 5/12% native PAGE gel and quickly separated by electrophoresis at 150 V for 30 min. FITC-peptide/DR1 complexes were then visualized using a FluorImager (Molecular Dynamics). Data were normalized and expressed as the percentage of FITC-peptide/DR1 complex remaining relative to the complex at t = 0, and fit to a single-exponential model (y = ae−bx). Each experiment was performed in triplicate, and the reported dissociation rate reflects the mean± SD of three independent experiments. Relative binding affinities were determined by a competitive binding assay essentially as described (18). DR1 (20 nm) was incubated with 20 nm of biotinylated HA peptide in PBS (0.1% BSA, 0.01% Tween 20, 0.1 mg/ml 4-(2-aminoethyl)-benzene sulfonyl fluoride, 0.1 mM iodoacetamide, 5 mM EDTA, 0.02% NaN3 (pH 7.2)) in the presence of varying amounts of inhibitor peptides for 3 days at 37°C. The incubation time ensures the majority (>65%) of DR1 protein participates in the peptide binding reaction to reach equilibrium. Bound biotinylated peptide was detected using a solid-phase immunoassay and Eu2+-labeled streptavidin. Plates were read using a Wallac VICTOR counter (PerkinElmer Wallac). Data were fit to a logistic equation y = a/[1 + (x/x0)b]. IC50 values were obtained from the curve fit of the binding data and converted to KD values by using the equation KD = (IC50)/(1 + [bHA]/KD,bHA)) in which KD,bHA was set equal to 14 nM on the basis of the results of the direct binding of bio-HA peptide to DR1. Each point represents the mean and SD of three independent experiments performed in quadruplicate. Because peptide/MHCII binding represents a multistep reaction, the IC50 for a competitive binding assay may not be directly proportional to the KD. Although this can be offset by long incubations relative to half-life, we study low affinity peptides where half-lives are impossible to determine. Therefore, the values of affinity reported herein should be considered as apparent KD values. We view cooperativity in peptide/MHCII folding as the enhancement in binding or dissociation that arises in a second (or subsequent) interaction as a result of the primary interaction. This definition has been used by others in the context of protein folding (19) or ligand binding (20). We used a multiple substitution strategy previously used to identify interacting partners during protein folding (21, 22). To normalize the t1/2 and KD values of a given peptide/MHCII complex, we define the effect of each substitution as the ratio of the substituted measurement over that of the DR1/wild-type (wt)HA value (Δt1/2 for stability or ΔKD for affinity). Normalization of the measurements to that of the DR1/wtHA complex also allows for comparison of cooperativity measures in stability, which is measured directly, and affinity, which is measured indirectly. For calculating cooperativity, the effect of multiple substitutions is measured directly (observed value). The expected value for a combination of substitutions is calculated as the product of the individual substitutions [e.g., Δt1/2,exp x,y = (Δt1/2, x) × (Δt1/2, y)]. For peptides with three substitutions, the expected value would be the product of all the different substitutions [e.g., Δt1/2,exp x,y,z = (Δt1/2, x) × (Δt1/2, y) × (Δt1/2, z)]. The cooperativity is the ratio of the expected to observed (C = exp/obs) values for either Δt1/2 or ΔKD. A value of 1 for the ratio of expected/observed indicates no cooperativity, for it would suggest independent energetic contribution in binding and/or release from each substitution. Cooperativity is evidenced when the ratio of expected/observed is not equal to 1. The interaction between the influenza HA peptide and DR1 has been extensively studied and the crystal structure of the complex is one of the first peptide/MHCII structures generated (5) (Fig. 1⇓A). As with many MHCII proteins, HLA-DR1 possess what are referred to as anchor interactions at P1, P4, P6, and P9 positions, where the pockets are deep and hydrophobic (Fig. 1⇓B). To test whether interactions at these positions would be cooperative, mutations were made at P1, P6, and P9. For the P1 position, it is well established that changing wt Tyr to Ala reduces the stability of the complex by 1000-fold (23). We have previously shown that changing P1 to the more conservative Leu and Val decreases the stability of the HLA-DR1/HA complex in the presence of SDS (24). The latter substitutions would provide an interaction sufficient for the formation of the complex, but when combined with substitutions at P6 and P9 could reveal also a measurable cooperativity in peptide release (Fig. 1⇓C, left). The P6 Lys substitution is located at a position where the relative DR binding site has a strong preference for small residues (Gly, Ala, Ser, and Pro), likely decreasing the affinity due to the long lateral chain. In contrast, the P6 Ala substitution could increase peptide binding (Fig. 1⇓C, center) (25). Predicting the effects of a particular mutation at P9 is difficult because at this position the peptide starts to bend out of the groove. Thus, depending on aspects of local water structure, the P9 position may be solvent exposed (6, 26). Taking into account this conformation, as well as the weak preference of P9 pocket for residues with some aliphatic character, the wt Leu has been substituted with Ala and Ser, leading to an increased solvation due to the loss of the methyl group (Fig. 1⇓C, right). 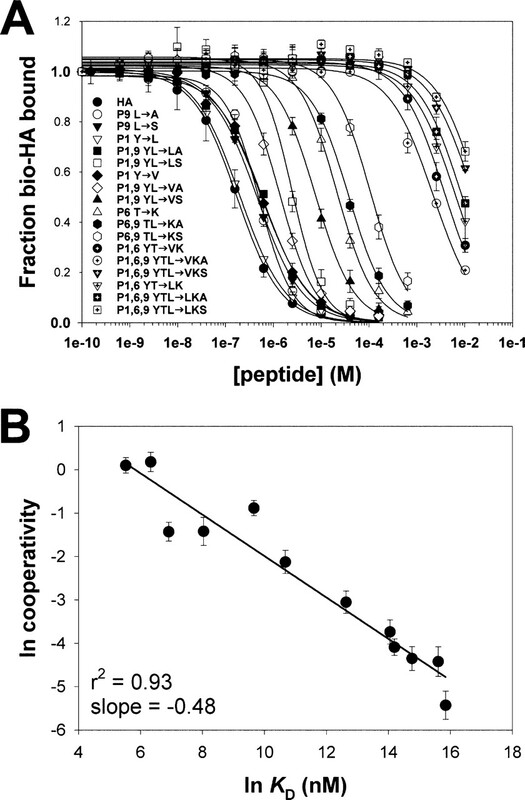 Substitutions in the HLA-DR1/HA complex to analyze cooperative interactions between peptide and MHCII. A, Side view of the molecular surface of the HLA-DR1 peptide-binding site is shown in partial transparent gray, with the HA peptide as a CPK model. HA peptide side chains binding through hydrophobic anchoring are labeled by the one-letter code. B, Top view of the molecular surface of the DR1 binding site. Pockets that accommodate HA peptide residues are labeled according to the P numbering system. C, Peptide substitutions of solvent inaccessible side chains. From the left P1, P6, and P9 pocket-side chain peptide interactions are shown. The P1 Tyr→Leu and Tyr→Val substitutions disrupt an H-bond, destabilizing the binding despite their higher hydrophobicity. The long lateral chain of the Lys instead of the wt Thr at P6 decreases the affinity for steric reasons, whereas the small Ala better fits this pocket, improving the binding. Decreased affinity by the P9 substitutions is postulated to arise from increased solvation at the end of the groove, due to the loss of the methyl group. Coordinates were taken from Stern et al. (5 ). The model was generated using PyMol (38 ). The rationale for the substitutions performed at positions involved in H-bonds has outlined (15). In brief, the P2 Val to Ser substitution would affect H-bonds between β82 Asn and the P2 amide and carbonyl groups. The P3 mutation, Lys to Asp, is postulated to destabilize the H-bonds between α9 Gln and α62 Asn with the carbonyl of P4. The substitution at P10, Val to Gly, is postulated to disrupt the H-bond between α76 and the P10 carbonyl. Also direct disruption (P2, P3) or solvent effect (P2, P3, P10) may play a role in destabilizing the peptide/MHCII interaction. To determine the effect of substitutions at the major hydrophobic pocket positions, P1 and P9, on the energetics of the complex, we examined complex stability by determining the dissociation rate (Fig. 2⇓A). The t1/2 values of the labeled peptides are reported in Table I⇑. Each individual substitution resulted in small to negligible effects on the dissociation rate whereas multiple substitutions had significantly larger effects. This large increase in dissociation rate suggested a cooperative effect. To test this possibility, the relative effect of each singly substituted complex was calculated with respect to the stability of the unsubstituted DR1/HA complex. If the contribution of each substitution to complex stability was independent, then the effect of multiple substitutions should equal the product of their individual effects on stability. The ratio of expected to observed stability gives the cooperativity. The data clearly indicate the presence of cooperative effect between the peptide and the MHCII in generating the final complex. Plotting the cooperativity values and t1/2 for each multisubstituted complex on a ln scale revealed an increasing cooperativity with decreasing t1/2, as the data can be fit to a linear regression with a negative slope (−0.71) (Fig. 2⇓B). Because of the poor binding properties of some of the multisubstituted complexes, dissociation rate data could only be obtained for 9 of the 18 possible complexes. Negative cooperativity in peptide/MHCII dissociation. A, Dissociation rates of HLA-DR1/peptide complexes were measured as described in Materials and Methods. Data are expressed as the fraction FITC-peptide/MHCII complex remaining relative to t = 0. Reactions were performed in triplicate, and data series represent one of three independent experiments. The lines represent the fit of the data to a single-exponential function. The t1/2 values are as reported in Table I⇑. B, Natural log (ln) plot of cooperativity vs dissociation rate for each peptide/MHCII complex tested. Because we defined cooperativity C as the ratio of the expected to observed values for Δt1/2, and t1/2 is directly proportional to stability, the cooperative effect is positive if 0 ≤ C < 1, while if C > 1 the cooperative effect is negative. In the ln plot, positive cooperativity in stability is indicated on the y-axis by values <0 and negative cooperativity by values >0. Horizontal error bars represent the SD of the t1/2 measurement. Vertical error bars represent the error of cooperativity as calculated through SE propagation. The line indicates the fit of the data to a linear regression. The stability analysis described above represents a direct measure of the cooperativity in the dissociation of the complexes. We would expect a cooperative effect in the affinity measurements of the various complexes. Peptide affinity was measured using an equilibrium-based competition-binding assay in which each peptide was tested for its ability to compete against the HA peptide for binding to DR1. This allowed us to examine cooperativity in highly unstable multisubstituted complexes for which dissociation rate data were difficult to obtain. The competition data for all the complexes are shown in Fig. 3⇓A and the KD values are reported in Table I⇑. Some of the peptides with P6 Lys substitution did not completely inhibit HA binding to DR1, even at relative high concentration. However, the data were sufficient to calculate an apparent affinity value. The calculation used for quantifying cooperative effect on peptide affinity was the same as performed for dissociation rate data. In this case, the effect of each substitution was compared with the KD of the unsubstituted DR1/HA complex and the calculated effect of multiple substitutions was obtained. Plotting cooperativity against the observed KD of each complex (Fig. 3⇓B), an exponential relationship was revealed, with cooperativity increasing as peptide affinity decreased (slope −0.48). Negative cooperativity in peptide affinity for MHCII. 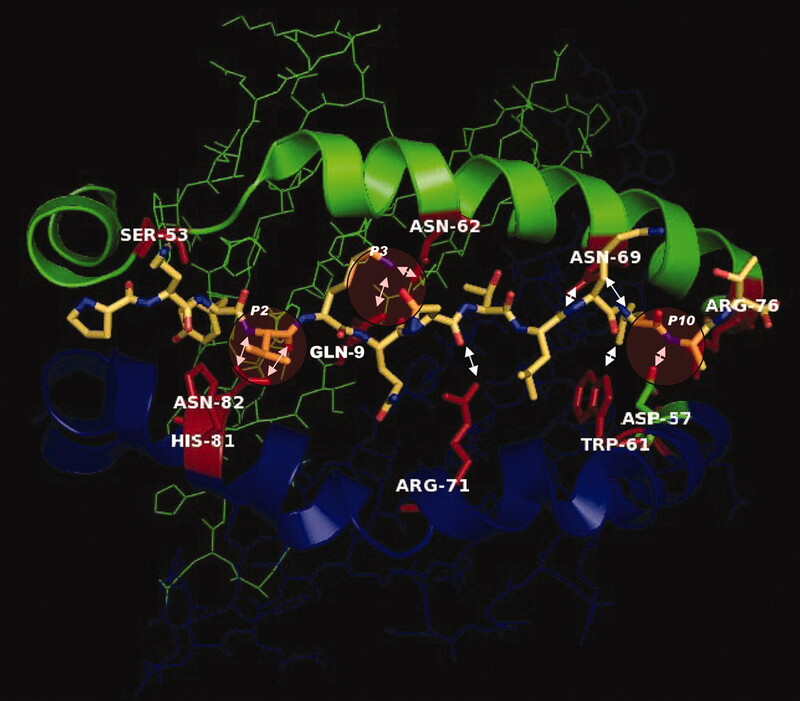 A, Competitive binding analysis of P1, P6, and P9 substituted HA peptide variants to DR1. Data represent the mean and SD of three independent experiments. Lines indicate the fit of the data to a logistic equation. KD values are as reported in Table I⇑. B, Natural log (ln) plot of cooperativity vs KD for each peptide/MHCII complex tested. Because we defined cooperativity C as the ratio of the expected to observed values for ΔKD, and KD is inversely proportional to affinity, the cooperative effect is positive if C > 1, while if 0 ≤ C < 1 the cooperative effect is negative. In the ln plot, positive cooperativity in affinity is indicated on the y-axis by values >0 and negative cooperativity by values <0.Vertical error bars are as described for Fig. 2⇑B. Previous studies conducted in different systems have been able to detect a positive cooperative effect in the protein folding process. We asked whether in the MHCII/peptide complex, a positive cooperativity at the level of the hydrophobic pocket interactions could also be observed. To investigate this possibility, we substituted Thr with Ala at P6, taking advantage of the preference of this position for small residues. We were able to obtain a direct value of the cooperativity measuring the effect of this substitution on the stability of the complex. As shown in Fig. 4⇓A dissociation rate data were obtained (t1/2 values of these complexes are reported in Table I⇑), cooperativity was calculated as described previously and plotted against the observed stability of the complex on a ln scale. As shown in Fig. 4⇓B, we found a positive exponential rise in the cooperative effect; the positive value of the slope (+1.01) indicates that the P6 Ala substitution results in a higher cooperative effect for complexes with lower stability. This positive effect on stability is indicated in Fig. 4⇓C. Peptides with P1/P9 double substitution, for which a negative cooperativity in stability was calculated, show a higher half-life than expected in the presence of the P6 Thr→Ala mutation. These results strongly suggest that the hydrophobic pocket interactions can show either positive or negative contributions to the folding process and the epitope selection. Positive cooperativity in peptide/MHCII dissociation for peptide P6 Ala substituted. A, Dissociation rates of HLA-DR1/peptide (P6 Thr→Ala) complexes were measured. Data are expressed as the fraction FITC-peptide/MHCII complex remaining relative to t = 0. Reactions were performed in triplicate, and data series represent one of three independent experiments. The lines represent the fit of the data to a single-exponential function. The t1/2 values are as reported in Table I⇑. B, Natural log (ln) plot of cooperativity (expected/observed t1/2) vs dissociation rate for each peptide/MHCII complex tested. As described for Fig. 2⇑B, negative values on the y-axis indicate a positive cooperative effect on complex stability. Error bars are omitted for graphic clarity. C, The effect of P6 Thr→Ala substitution on cooperativity is shown for peptides substituted at P1 and P9. In each bar group, the observed ratio (shaded bars) of t1/2 values for each peptide/MHCII complex as compared with the t1/2 of the DR1/HA is plotted alongside the calculated t1/2 ratio (dark bars) for each complex assuming an independent effect of each substitution. A previous report has showed no evidence of cooperativity between anchors and adjacent H-bonds for peptide/I-Ad complexes, suggesting that a certain amount of additivity is inherent to peptide binding (16). We asked whether in our model, simultaneous substitution at positions with intermediate solvent accessibility and positions involved in hydrophobic interactions could result in a cooperative effect. To investigate this possibility, we performed simultaneous substitutions of the P1 and P9 residues (Fig. 1⇑C, left and right columns), providing hydrophobic interactions, and P2, P3, and P10 residues to affect H-bonds (Fig. 5⇓), in different combinations, analyzing the relative contribution of these substitutions to the cooperative effect. 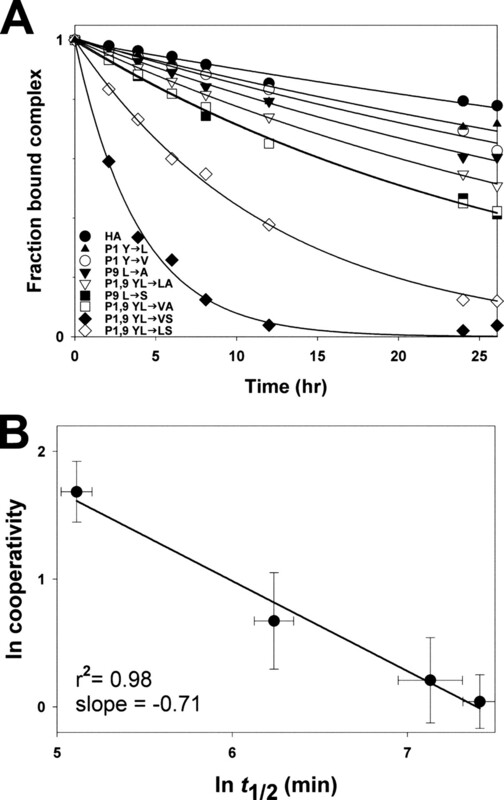 Substitutions in the HLA-DR1/HA complex at positions with intermediate solvent accessibility. The DR1 molecule complexed to a peptide substituted at P2, P3, and P10 positions is shown with H-bonds designated as white arrows. The α-chain is in green and the β-chain in blue. The peptide substitutions of solvent accessible side chains that are postulated to directly or indirectly disrupt the H-bond network are highlighted in red. The side chains belonging to α- and β-chains that establish H-bond with the peptide are indicated. The rationale of the substitutions is outlined in Results. Coordinates were taken from Stern et al. (5 ). The model was generated using PyMol (38 ). The low binding properties of these peptides allowed us to evaluate only their affinity, rather than the stability of the complexes (Fig. 6⇓A). Similar to the result obtained previously, we found a high correlation between cooperativity and KD (Fig. 6⇓B). KD values are as reported in Table II⇓. For instance, the P2,10 VA→SG mutant binds 4-fold weaker than the wt HA to DR1, whereas the P2,9,10 VLA→SSG has an affinity that is 60.5-fold lower, showing than the 2.5-fold loss in binding due to the sole substitution at P9 L→S enhances the destabilization of the P2 and P3 interactions. Similarly, destabilization of the P1 interaction (e.g., P1 Y→V) decreases the affinity of those peptides already affected by the P2,10 VA→SG substitutions (a reduction up to 14-fold in affinity compared with the wt HA would be expected on the basis of additive contribution, whereas the KD measured is 350-fold higher than that for HA). Fig. 6⇓C shows that peptides carrying the P3 K→D mutation are particularly cooperative due to the substitution at P1 and/or P9. Of note is the finding that the mutation at P10, which is thought to affect H-bonding shows a cooperative effect with P1 at the opposite end of the groove. Taken together, these results indicate that all sources of binding energy can have an effect on mediating cooperativity in peptide/MHCII interactions. Effect of simultaneous substitution at hydrophobic residues and residues with intermediate solvent accessibility on cooperativity. A, Competitive binding analysis of P1, P2, P3, P9, and P10 substituted HA peptide variants to DR1. Data represent the mean and SD of three independent experiments. Lines indicate the fit of the data to a logistic equation. B, Natural log (ln) plot of cooperativity (expected/observed KD) vs KD for each peptide/MHCII complex tested. Vertical error bars are as described for Fig. 2⇑B. C, The observed ratio (gray bars) of KD values for each peptide/MHCII complex as compared with the KD of the DR1/HA is plotted alongside the calculated KD ratio (black bars) for each complex assuming an independent effect of each substitution. In this study, we continue to investigate the model by which the formation of the peptide/MHCII complex can be viewed as a folding process. Our experiments are based on a multiple substitution strategy, previously described for the study of cooperative interactions in protein folding. Through this approach, one can construct a series of higher order mutant cycles to analyze the impact of different peptide substitutions relative to the wt HA sequence on complex energetics. We have previously tested the hypothesis that epitope selection is a distributive process (27) and we have recently observed that peptide binding is highly cooperative for peptides substituted in residues showing intermediate solvent accessibility (15). We interpreted our results in terms of disruption of the H-bond network at these positions. In that analysis, a substitution affecting a minor hydrophobic pocket interaction (P7) also showed cooperativity. We thus extended our previous studies to positions at which solvent accessibility is minimal, testing whether the major hydrophobic pocket interactions show cooperativity. By kinetic and competitive analysis of the substituted complexes, we found the presence of cooperative effects on stability and affinity, respectively. Furthermore, the cooperative effect can operate in a negative or in a positive manner, depending on how each substitution contributes to the conformation of the final MHCII/peptide complex. Finally, using peptides mutated at anchor positions and at positions with intermediate solvent accessibility, we observed that a cooperative effect can be detected between residues that rely on hydrophobic interactions and those relying more on H-bonding, even when they are at a distance in the binding groove. Direct visualization of conformational changes occurring during protein folding has been a long-standing problem in structural biology. However, conformational rearrangements in proteins are often characterized by measurable cooperative effects between functional subunits in the molecule (14). We think that peptide/MHCII binding may be explained with this approach, because it has been considered a bimolecular folding event (13). In the MIIC, MHCII could exist as a partially unfolded molecule in a rapid random search of conformations around any peptide that might have become partially anchored due to hydrophobic interactions, until sufficient tertiary interactions are made that stabilize certain elements of secondary structure. The cooperativity between anchors we observe can be interpreted as the progressive formation of defined pockets in the MHCII groove during this process, with each productive peptide/MHCII interaction influencing another one. Moreover, our data showing a cooperative effect between hydrophobic residues and H-bonds indicate that the latter are not energetically segregated from the anchor interactions so that they can more easily be formed to the peptide backbone in the presence of anchor interactions below them, and these are stabilized thanks to the H-bond network. Eventually, when sufficient interactions are made, the transition state would be reached and there would follow the rapid formation of the final structure. How does the distributive binding process impact the epitope selection? An appealing model to explain stable peptide binding would recall the nucleation-condensation mechanism. The initial event of the process would involve scanning for hydrophobic side chain to fill the P1 pocket. Previous analysis of P1 in HLA-DR showed that filling this pocket is a primary requirement (28), and the nature of the pocket 1 interaction could be influenced by other polymorphic positions (29, 30). It has already been suggested that the possibility that formation of a key cluster of interactions around the P1 pocket is sufficient to nucleate a conformational change that extends throughout the peptide-binding groove (31). This first rearrangement would indeed trigger the involvement of the adjacent, partially disordered, α1/β1 helical regions and it would facilitate the formation of the other pocket/side chain interactions. At first, the nucleus would be stabilized by the interactions in the P(−1) to P2 region, where the H-bonds between Hisβ (81) and Asnβ (82), as well as the residues from α (51) to α (53), and the bound peptide, have been recognized as critical for the complex stability (31, 32, 33). Then, the onrush of cooperative interactions would operate: 1) inducing the folding of the helices; 2) inducing the other hydrophobic pocket interactions; 3) stabilizing both types of binding energy; 4) inducing the folding of the peptide into a polyproline type II conformation. Thus, further stabilization of the nucleus would require the correct conformation of contacts by a significant fraction of the structures on the C-terminal region, both from the peptide and the MHCII. This would explain why the P1 occupancy, required for promoting conversion to the compact form of the MHCII, is not sufficient for high affinity binding, which needs main chain interactions in the P5-P9 region (31). The transition state in the reaction leading to the close conformer would be reached at this point, with the whole molecule involved with mutual cooperative interactions in strengthening the nucleus. Rapid formation of the final structure would follow. As a direct consequence, the outcome of the epitope selection would be based on the ability of each binding energy to impact the folding process. Further investigation using nuclear magnetic resonance analysis and calculation of Φ values would be required to prove the validity of our hypothesis (34). Our results clearly show the presence of a cooperative effect between the H-bond network and the hydrophobic anchoring system. In light of the importance of the P1 interaction (23, 28, 29, 30), and our restricted use of substitutions that still allow measurable complex formation, it is unclear whether cooperativity would be observed with more drastic substitutions such as Ala or Gly. Moreover, our findings may not be valid for all allelic and isotypic forms of MHCII. For instance, a recent study, investigating the energetics of the peptide/I-Ad complex, showed that the contribution of a given anchor-pocket pair in binding depends on the overall peptide sequence, but no evidence for cooperativity between anchor residue interactions and H-bonds was detected, independent of the distance (16). It should be pointed out that I-Ad may depend less on strong pocket interactions, relying to an atypically high degree on H-bonding interactions (35). This could explain the difference in the binding process between the two, leaving the question open whether it is possible to hypothesize a common binding model for the MHCII, regardless of the isotypes. Most of the algorithms elaborated thus far to predict good epitopes assume that a few ligand/receptor interactions (anchor/pocket) act independently of each other to provide the majority of the binding energy. The presence of cooperative effects in the MHCII/peptide interaction imposes an additional level of complexity to the process of epitope prediction on the basis of the primary sequence. We have previously proposed that the magnitude of the cooperative effect is directly related to the equilibrium state between the open and the closed conformers of the peptide/MHCII complex (15). The present results indicate that each position contributes to shift the equilibrium in favor of the open (negative cooperativity) or closed (positive cooperativity) conformer in a specific way. To incorporate cooperative effects into epitope prediction algorithms, a higher degree of peptide complexity must be sampled. One approach we are pursuing consists in synthesizing more diverse combinatorial peptide libraries in which a single amino acid is held constant while the remainder of the peptide sequence is randomized and studying the energetics of the new complexes. Similar strategies have been useful to predict MHCI-binding peptides (36, 37). However, the presence of cooperative effects will necessarily require the calculation of folding energy, which would be able to consider also epitope presentation in the absence of any definable binding motifs or anchor/pocket interactions (35). We expect that the rational design of peptide-based vaccines or peptide therapeutics should be greatly improved by considering this fundamental aspect of peptide/MHCII interaction. We thank Trudy Holyst for peptide synthesis, Dr. Lawrence Stern for DR1 expressing S2 cells, and Dr. Matthew Anderson for scientific advice and helpful discussion. ↵1 This work was supported by National Institutes of Health Grant R01AI63016. ↵3 Abbreviations used in this paper: MHCII, MHC class II; HA, hemagglutinin; wt, wild type; DR1, HLA-DR1; H-bond, hydrogen bond; exp, expected; obs, observed. Watts, C., S. Powis. 1999. Pathways of antigen processing and presentation. Rev. Immunogenet. 1: 60-74. Brocke, P., N. Garbi, F. Momburg, G. J. Hammerling. 2002. HLA-DM, HLA-DO and tapasin: functional similarities and differences. Curr. Opin. Immunol. 14: 22-29. Fremont, D. H., W. A. Hendrickson, P. Marrack, J. Kappler. 1996. Structures of an MHC class II molecule with covalently bound single peptides. Science 272: 1001-1004. Jardetzky, T. S., J. H. Brown, J. C. Gorga, L. J. Stern, R. G. Urban, J. L. Strominger, D. C. Wiley. 1996. 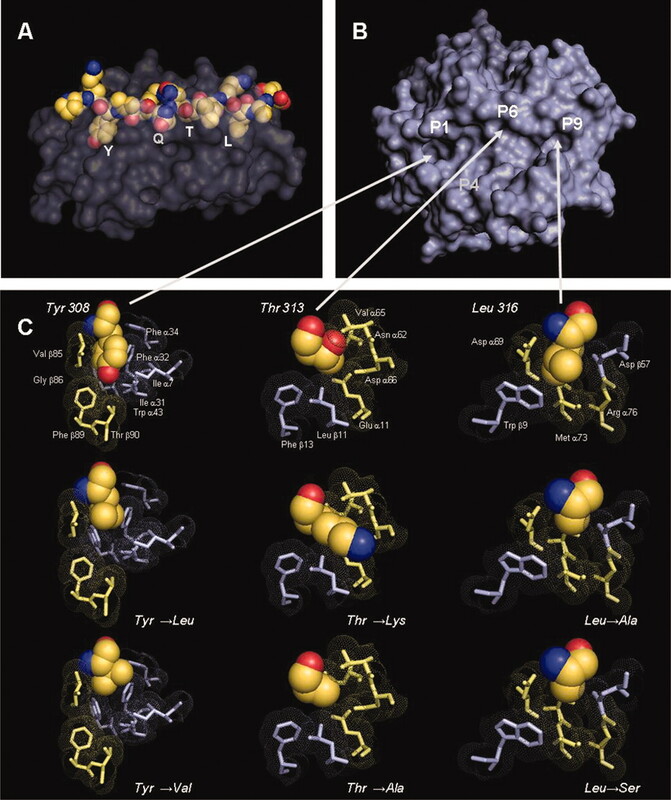 Crystallographic analysis of endogenous peptides associated with HLA-DR1 suggests a common, polyproline II-like conformation for bound peptides. Proc. Natl. Acad. Sci. USA 93: 734-738. Stern, L. J., J. H. Brown, T. S. Jardetzky, J. C. Gorga, R. G. Urban, J. L. Strominger, D. C. Wiley. 1994. Crystal structure of the human class II MHC protein HLA-DR1 complexed with an influenza virus peptide. Nature 368: 215-221. Latek, R. R., A. Suri, S. J. Petzold, C. A. Nelson, O. Kanagawa, E. R. Unanue, D. H. Fremont. 2000. Structural basis of peptide binding and presentation by the type I diabetes-associated MHC class II molecule of NOD mice. Immunity 12: 699-710. Bian, H., J. F. Reidhaar-Olson, J. Hammer. 2003. The use of bioinformatics for identifying class II-restricted T-cell epitopes. Methods 29: 299-309. Sturniolo, T., E. Bono, J. Ding, L. Raddrizzani, O. Tuereci, U. Sahin, M. Braxenthaler, F. Gallazzi, M. P. Protti, F. Sinigaglia, J. Hammer. 1999. Generation of tissue-specific and promiscuous HLA ligand databases using DNA microarrays and virtual HLA class II matrices. Nat. Biotechnol. 17: 555-561. Joshi, R. V., J. A. Zarutskie, L. J. Stern. 2000. A three-step kinetic mechanism for peptide binding to MHC class II proteins. Biochemistry 39: 3751-3762. Sadegh-Nasseri, S., H. M. McConnell. 1989. A kinetic intermediate in the reaction of an antigenic peptide and I-Ek. Nature 337: 274-276. Sadegh-Nasseri, S., L. J. Stern, D. C. Wiley, R. N. Germain. 1994. MHC class II function preserved by low-affinity peptide interactions preceding stable binding. Nature 370: 647-650. Sadegh-Nasseri, S., R. N. Germain. 1991. A role for peptide in determining MHC class II structure. Nature 353: 167-170. Sadegh-Nasseri, S., R. N. Germain. 1992. How MHC class II molecules work: peptide-dependent completion of protein folding. Immunol. Today 13: 43-46. Fersht, A. R.. 1999. Structure and Mechanism in Protein Science: A Guide to Enzyme Catalysis and Protein Folding W. H. Freeman, New York. Anderson, M. W., J. Gorski. 2005. Cooperativity during the formation of peptide/MHC class II complexes. Biochemistry 44: 5617-5624. McFarland, B. J., J. F. Katz, A. J. Sant, C. Beeson. 2005. Energetics and cooperativity of the hydrogen bonding and anchor interactions that bind peptides to MHC class II protein. J. Mol. Biol. 350: 170-183. Stern, L. J., D. C. Wiley. 1992. The human class II MHC protein HLA-DR1 assembles as empty α β heterodimers in the absence of antigenic peptide. Cell 68: 465-477. Jensen, P. E., J. C. Moore, A. E. Lukacher. 1998. A europium fluoroimmunoassay for measuring peptide binding to MHC class I molecules. J. Immunol. Methods 215: 71-80. Creighton, T. E.. 1995. Protein folding: an unfolding story. Curr. Biol. 5: 353-356. Williams, D. H., M. Zhou, E. Stephens. 2006. Ligand binding energy and enzyme efficiency from reductions in protein dynamics. J. Mol. Biol. 355: 760-767. Horovitz, A., A. R. Fersht. 1990. Strategy for analysing the co-operativity of intramolecular interactions in peptides and proteins. J. Mol. Biol. 214: 613-617. Horovitz, A., A. R. Fersht. 1992. Co-operative interactions during protein folding. J. Mol. Biol. 224: 733-740. Jardetzky, T. S., J. C. Gorga, R. Busch, J. Rothbard, J. L. Strominger, D. C. Wiley. 1990. Peptide binding to HLA-DR1: a peptide with most residues substituted to alanine retains MHC binding. EMBO J. 9: 1797-1803. Wu, S., J. Gorski, D. D. Eckels, D. K. Newton-Nash. 1996. T cell recognition of MHC class II-associated peptides is independent of peptide affinity for MHC and sodium dodecyl sulfate stability of the peptide/MHC complex: effects of conservative amino acid substitutions at anchor position 1 of influenza matrix protein 19–31. J. Immunol. 156: 3815-3820. Zavala-Ruiz, Z., E. J. Sundberg, J. D. Stone, D. B. DeOliveira, I. C. Chan, J. Svendsen, R. A. Mariuzza, L. J. Stern. 2003. Exploration of the P6/P7 region of the peptide-binding site of the human class II major histocompatability complex protein HLA-DR1. J. Biol. Chem. 278: 44904-44912. Corper, A. L., T. Stratmann, V. Apostolopoulos, C. A. Scott, K. C. Garcia, A. S. Kang, I. A. Wilson, L. Teyton. 2000. A structural framework for deciphering the link between I-Ag7 and autoimmune diabetes. Science 288: 505-511. Anderson, M. W., J. Gorski. 2003. Cutting edge: TCR contacts as anchors: effects on affinity and HLA-DM stability. J. Immunol. 171: 5683-5687. Natarajan, S. K., L. J. Stern, S. Sadegh-Nasseri. 1999. Sodium dodecyl sulfate stability of HLA-DR1 complexes correlates with burial of hydrophobic residues in pocket 1. J. Immunol. 162: 3463-3470. Ong, B., N. Willcox, P. Wordsworth, D. Beeson, A. Vincent, D. Altmann, J. S. Lanchbury, G. C. Harcourt, J. I. Bell, J. Newsom-Davis. 1991. Critical role for the Val/Gly86 HLA-DR β dimorphism in autoantigen presentation to human T cells. Proc. Natl. Acad. Sci. USA 88: 7343-7347. Wu, S., J. Gorski. 1997. Polymorphism at β 85 and not β 86 of HLA-DR1 is predominantly responsible for restricting the nature of the anchor side chain: implication for concerted effects of class II MHC polymorphism. Int. Immunol. 9: 1495-1502. Sato, A. K., J. A. Zarutskie, M. M. Rushe, A. Lomakin, S. K. Natarajan, S. Sadegh-Nasseri, G. B. Benedek, L. J. Stern. 2000. Determinants of the peptide-induced conformational change in the human class II major histocompatibility complex protein HLA-DR1. J. Biol. Chem. 275: 2165-2173. McFarland, B. J., C. Beeson, A. J. Sant. 1999. Cutting edge: a single, essential hydrogen bond controls the stability of peptide-MHC class II complexes. J. Immunol. 163: 3567-3571. McFarland, B. J., J. F. Katz, C. Beeson, A. J. Sant. 2001. Energetic asymmetry among hydrogen bonds in MHC class II*peptide complexes. Proc. Natl. Acad. Sci. USA 98: 9231-9236. Itzhaki, L. S., D. E. Otzen, A. R. Fersht. 1995. The structure of the transition state for folding of chymotrypsin inhibitor 2 analysed by protein engineering methods: evidence for a nucleation-condensation mechanism for protein folding. J. Mol. Biol. 254: 260-288. Scott, C. A., P. A. Peterson, L. Teyton, I. A. Wilson. 1998. Crystal structure of two I-Ad-peptide complexes reveal that high affinity can be achieved without large anchor residues. Immunity 8: 319-329. Kozono, H., J. White, J. Clements, P. Marrack, J. Kappler. 1994. Production of soluble MHC class II proteins with covalently bound single peptides. Nature 369: 151-154. Stryhn, A., L. O. Pedersen, T. Romme, C. B. Holm, A. Holm, S. Buus. 1996. Peptide binding specificity of major histocompatibility complex class I resolved into an array of apparently independent subspecificities: quantitation by peptide libraries and improved prediction of binding. Eur. J. Immunol. 26: 1911-1918. De Lano, W. L.. 2002. The PyMOL Molecular Graphics System De Lano Scientific, San Carlos, CA.